2012 Normandie - James W. Lett, Ph.D. These photographs and notes are from our two-week trip to Normandie in July. The weather was consistently cool and decidedly pleasant. Chateau Balleroy was built in 1631 by the influential architect Francois Mansart (1598-1666). It was purchased in 1970 by the late American publisher Malcolm Forbes, who began an ambitious project to restore the buildings and grounds--a project that reportedly continues today under the direction of his five surviving children (we took a guided tour that was conducted in French, which means we understood about 75% of what they told us). The walls of one hallway are lined with photographs of Forbes posing with various U.S. presidents, providing striking visual confirmation of the obvious fact that money buys access to power (it also, apparently, can buy marvelous architecture, and that's probably a more lasting legacy). Colombières has a small handful of rooms that are available for nightly rentals during the summer season. 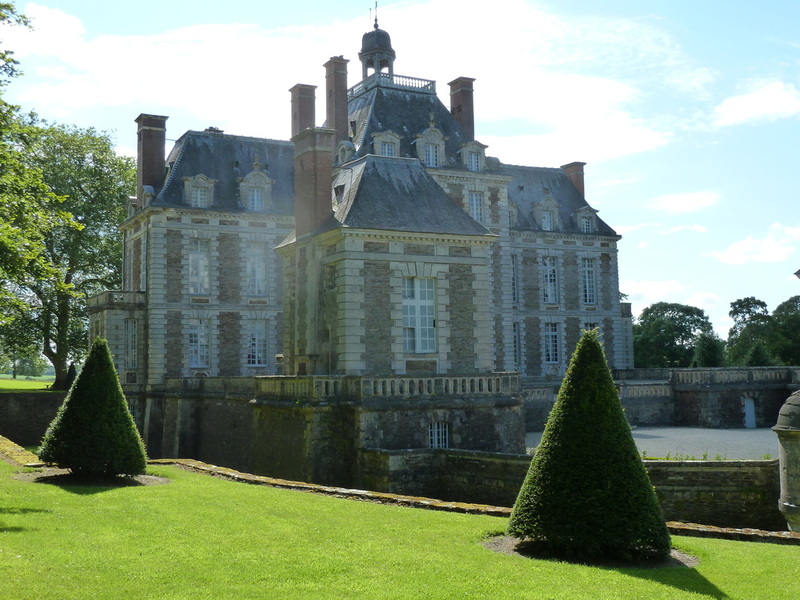 The chateau is located a few miles inland from the D-Day beaches; it was occupied by the Germans during World War II, and liberated by the Americans on June 8, 1944 (two days after the invasion). The earliest part of the chateau dates to the 14th century, when it was built as a military fortification. 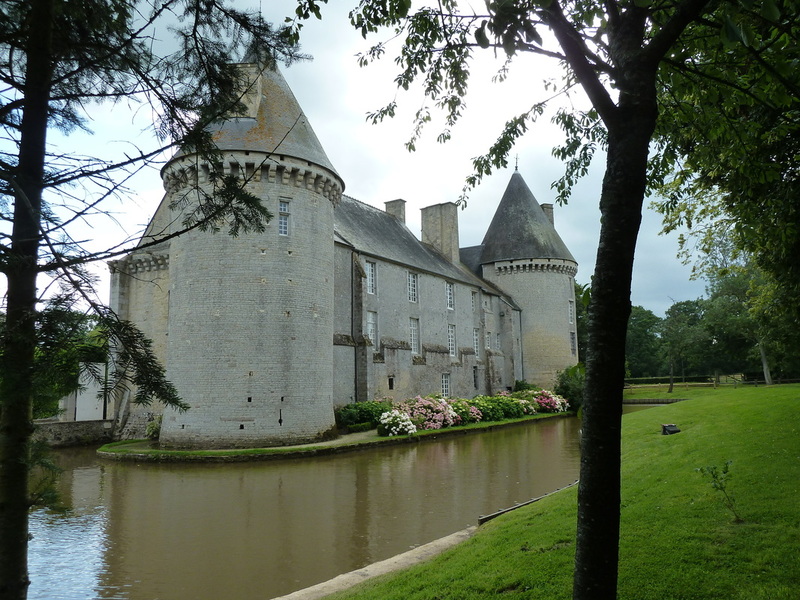 In subsequent centuries, some of the outer walls were torn down, and the interior living spaces were modernized. 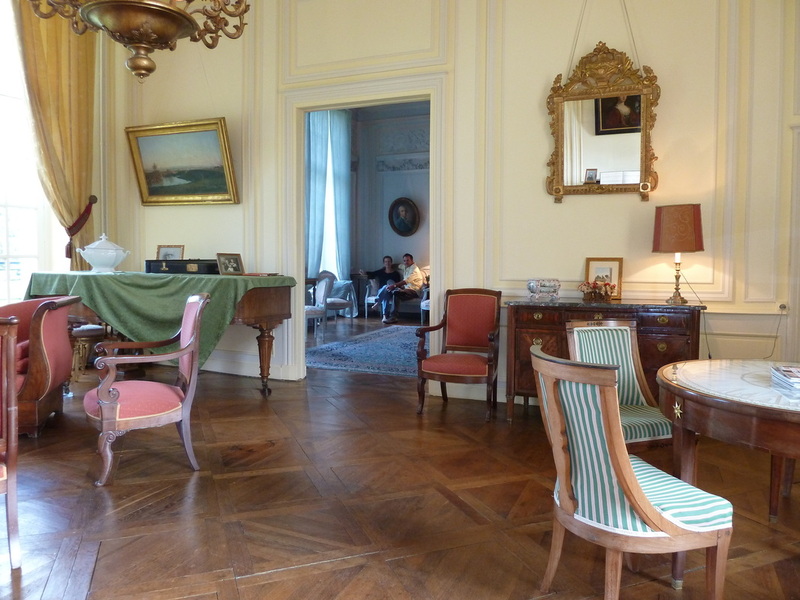 Our suite at the Chateau de Colombieres, which was on the second floor of the tower (first floor, for Europeans) included the requisite cavernous fireplace and an antique tapestry. If you're looking for a palpable sense of history (and who isn't, quand en France? ), look for stone walls, high ceilings, exposed beams, and musty smells--you won't be disappointed. When we arrived in France on the 5th of July, we spent our first two nights in the Château de Bonnemare, located between Paris and Rouen near Les Andelys. 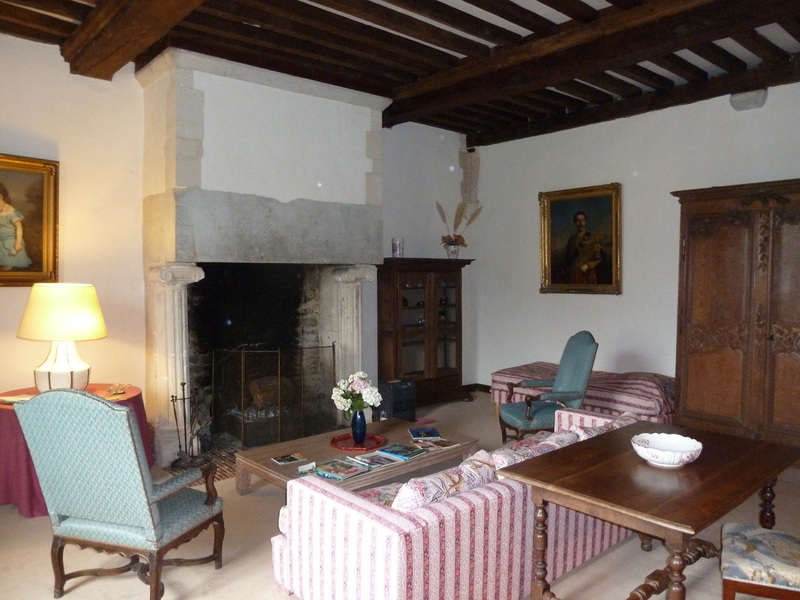 This 16th-century chateau is today a bed-and-breakfast whose charming owners live in a portion of the building. The grounds are huge, covering many heavily-wooded acres, and the two large suites available for guests are exceptionally well appointed. The Abbey of Mortemer ("Dead Sea") is located in the heart of the Forêt de Lyons. 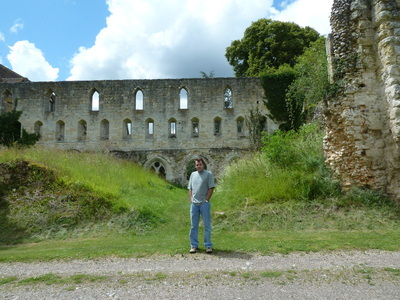 Built in 1134, it was home to numerous generations of Cistercian monks until it was closed in the late 18th-century during the French Revolution. Imagine all those unknown and largely forgotten men who spent their lives getting up in the middle of the night to kneel down on cold stone floors and murmur obsequious flattery to their imaginary magic-father-in-the-sky (a being whose most salient characteristics were known to be his unrelenting sadomasochism and his deep desire to make people feel guilty about what he perceived to be their innately evil natures). A ruined abbey is a good abbey. We spent one week revisiting the picturesque village of Pont d'Ouilly, staying in the same 19th-century stone farmhouse that had been our gite in 2011. 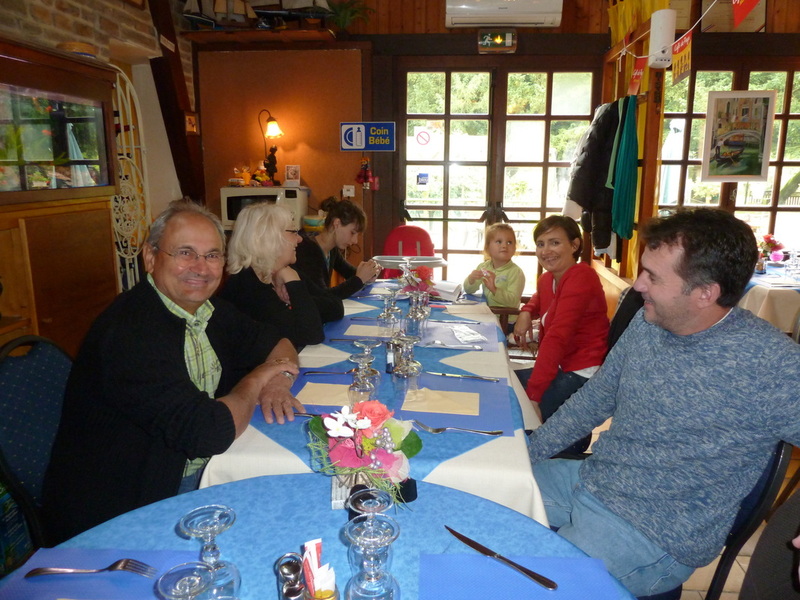 Our French friend Anne-Laure and her family made the three-hour trip from their home in the Ile de France to join us for an overnight stay, and we had Sunday lunch at a charming casual restaurant on the River Orne. Anne-Laure spent a year living with me in Florida in 1990-91, when she was an 18-year-old exchange student; today she's a 40-year-old mother with a precocious daughter. La vie est courte; vraiment, la vie est très courte.